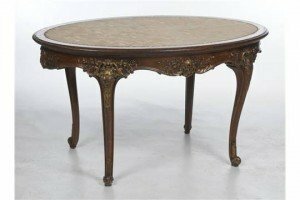 A French beech wood and painted oval centre table inset with a silk oval above a shaped apron carved and highlighted in gilt with shells, leaves and flowers raised upon four curvilinear shell and leaf carved legs, leafy scroll toes. 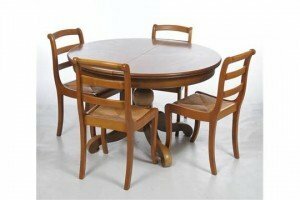 A Roger Chevron Grange extending elm dining table with two D shape ends cross banded border, with two leaves and four conforming rush seat ladder back dining chairs. 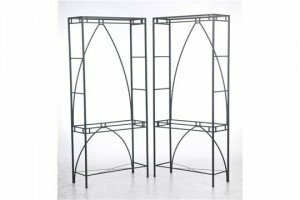 A pair of painted wrought metal shelf units each of upright rectangular form with arched centres complete with plate glass shelves. 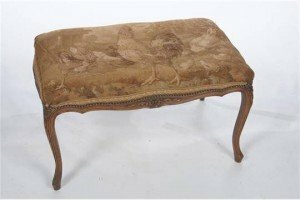 A French beech wood and tapestry dressing stool depicting a cockerel, hens and chicks, the shaped aprons carved with flowers and leaves raised upon curvilinear carved legs. 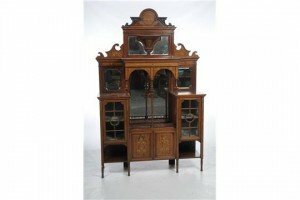 An Edwardian rosewood and ivory inlaid mirror back cabinet, the shaped leaf carved cresting centred with a roundel finely inlaid with stained wood and ivory leaves and flowers above an inlaid frieze above a vase shaped shelf finely inlaid with sea creatures, a quiver and a torch, flanked by bevelled mirrors and inlaid shaped spandrels. 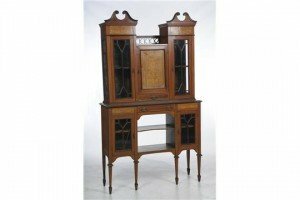 An Edwardian inlaid mahogany cabinet with swan neck cresting’s above panels inlaid with drapery and flowers and a cupboard door inlaid with scrolling leaves and a lattice panel above a drawer flanked by glazed cabinet doors, the lower part with a frieze drawer and inlaid panels above a concave shelf flanked by glazed cabinet doors raised upon tapering legs and spade feet. 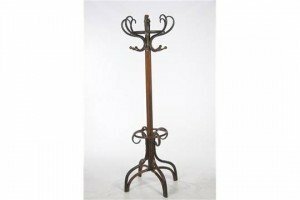 A bent wood hat, coat and stick stand early 20th century with a turned finial, eight scrolling hooks, square shaped central section raised upon quadruple down swept legs. 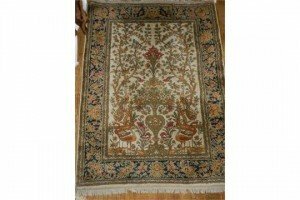 A Persian style floral carpet, the field decorated with a floral urn, multi-bordered and fringed. 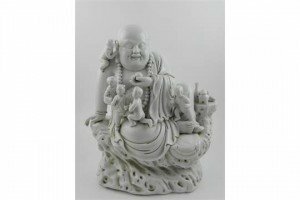 A Chinese blanc de chine hard paste porcelain figural group of a Buddha with children in attendance, raised on a naturalistic rock base. 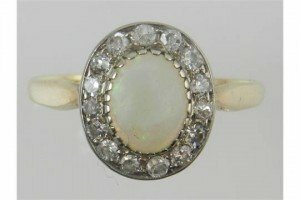 An opal and diamond yellow metal dress ring, centred with a cabochon opal within diamond set reserves. 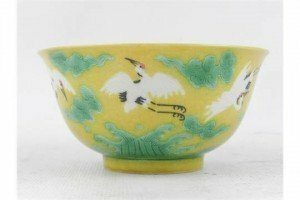 A Chinese porcelain rice bowl, decorated flying cranes above choppy waters on a yellow ground, raised rim foot bearing six character marks to the base. 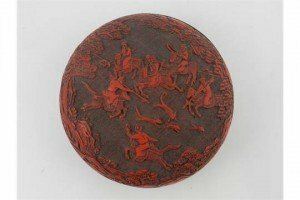 A Cinnabar style red and black lacquered circular box with cover, relief carved and centred with a hunting scene. 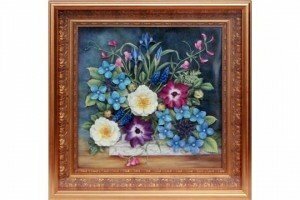 A large later 20th Century Diane Lewis Chance framed porcelain plaque formed with a spray of relief applied flowers against a hand painted ground, entitled to verso Midnight Blue. 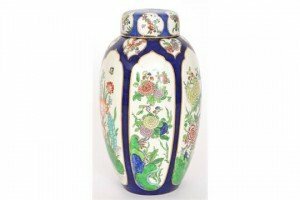 An early 20th Century Carlton Ware Kang Hsi vase and cover decorated with panels of Chinoiserie decoration against a dark blue ground. 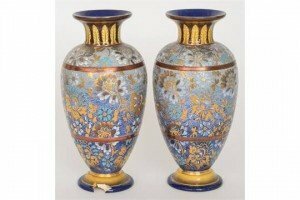 A pair of Doulton Slaters Patent Chine ware baluster vases, each decorated in tones of blue with gilt and white enamel flowers, the necks with stiff leaf borders. A 9ct gold aquamarine and diamond cluster ring. 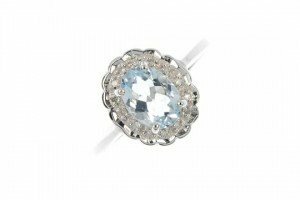 The oval-shape aquamarine, within a single-cut diamond scalloped surround, to the tapered shoulders and plain band. 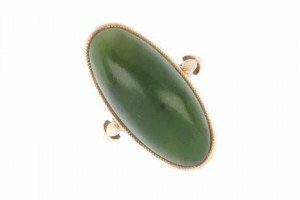 A jade ring. The oval nephrite cabochon collet, to the trifurcated shoulders and plain band. Weight 6.6gms. An 18ct gold diamond cluster ring. 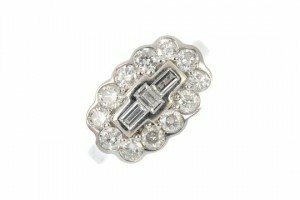 The three baguette-cut diamonds, within a brilliant-cut diamond scalloped surround, to the plain band. Total diamond weight 1.50cts. 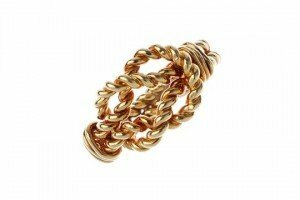 A knot dress ring. The rope-twist knot, to the grooved shoulders and rope-twist band. Weight 7gms.